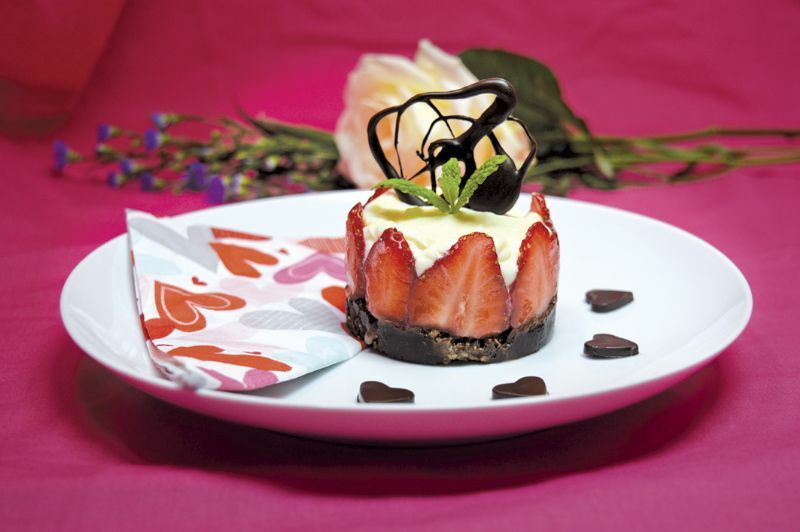 This indulgent dessert will surely help to win over your loved one this Valentine’s Day! For the base and sides: 40g plain chocolate; 75g Hobnob biscuits (or similar); 225g strawberries. For the mousse: 200g good quality white chocolate; 200g full-fat cream cheese; 200ml full-fat crème fraiche. 1 Place six 6cm x 7cm metal rings on a baking tray lined with greaseproof paper. 2 Put the plain chocolate into a medium bowl and melt gently over a pan of simmering water. 3 Crush the biscuits (pop them in a bag and use a rolling pin) then add them to the chocolate and stir until covered. 4 Press the mixture into the bottom of the rings with a teaspoon and pop in the fridge to set. 5 In another bowl, break up then carefully melt the white chocolate using the same method as above. Leave to cool then add the cream cheese and crème fraiche and mix until smooth. 6 Remove the rings from the fridge then slice the strawberries thinly and arrange them around the sides of the rings. 7 Spoon the mixture carefully onto the biscuit base and level off the tops – it doesn’t have to be smooth. 8 Chill the mousses until firm. 9 Carefully remove from the rings and serve on a plate. Decorate with chocolate hearts, mint leaves, a drizzle of chocolate or love hearts! The swirly chocolate decoration was from leftover chocolate, which I drizzled onto greaseproof paper and put in the fridge to set. Tip: This is a very rich dessert so I served it with the leftover strawberries.